Many centuries ago, the great philosopher of antiquity – Aristotle had established a school for the talented children in Athens. It was called the Lyceum. On October 19th, 1811, in the town of Tsarskoe Selo (today’s town of Pushkin), there was established the school for children of nobles, which has got the same name. 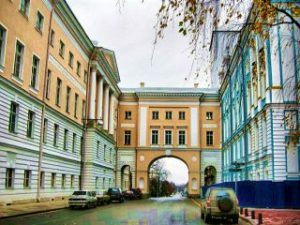 The founders of the institution cherished the hope that the Lyceum of Tsarskoe Selo will become the ideological successor of the famous Lyceum of antiquity. In different times, among the students of the school were many famous russians, but the first graduates of the school became a real pride of Russia: a famous poet Alexander Pushkin, the poet and journalist – Anton Delvig, the poet and member of the Decembrist uprising – Wilhelm Kuchelbecker, Rear-Admiral Matyushkin, the Commander of the Caucasian Staff – V. Volhovsky, the minister of foreign affairs of the State – Gorchakov. This High School, was raised for the training of officials responsible for public affairs. Due to the extensive educational program and the broad field of education, the students contributed to the development of whole Russia, making discoveries in various areas – public, academic, cultural, artistic and social.